This is the best restaurant-style Achari Paneer Tikka made at home. It is flavoursome and so easy to prepare. 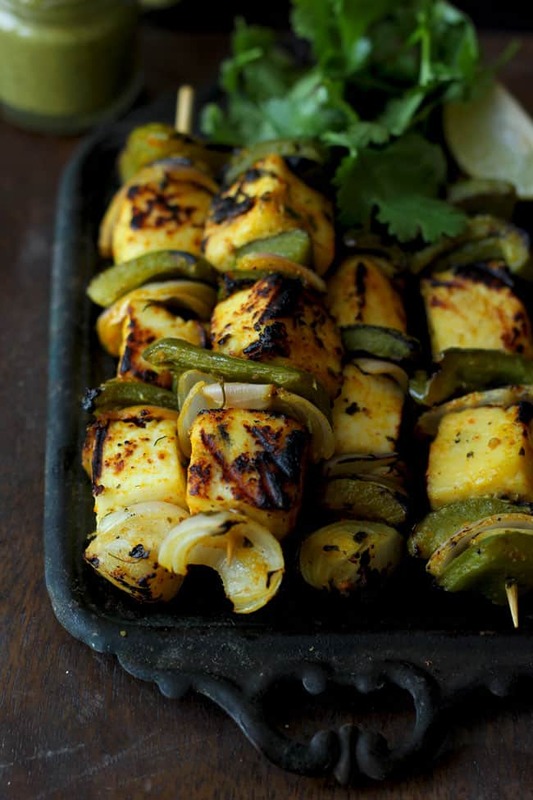 Only 20 minutes are required to whip a deliciously aromatic marinade for the paneer tikka. And a super fancy snack is sorted for the party. Easy Indian recipes like this one are truly worth bookmarking. Why? Because they require minimal effort and produce a finger-licking good end result. A few days back we hosted a barbecue party on a bright lovely Sunday afternoon. These Indian style cottage cheese skewers were there on the menu. And everybody loved it to the core. But the next day I was left with plenty of marinated paneer tikka. Like a true food blogger, I turned it into a lip-smacking achari paneer tawa pulao. Packed it for the husband’s lunchbox and saved a bowl for my lunch. Achari Paneer Tawa Pulao is probably the best use of marinated paneer apart from tucking it inside the sandwiches and wraps. How To Make Paneer Tikka In The Oven? Marinate the paneer as suggested in the recipe. Skewer the paneer and the vegetables. You can either roast the paneer tikka in the oven or bake them. For baking, preheat the oven to 200 degrees C.
While baking the tikka, turn it 10 minutes on each side. Once the edges of the paneer and the vegetables start turning crisp and brown it is ready to serve. 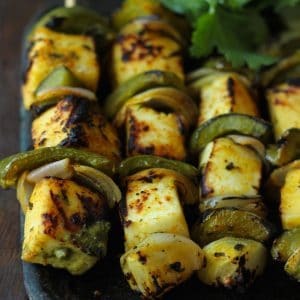 How To Make Paneer Tikka on Tawa? Soak the bamboo skewers in water for 15 – 20 minutes. Skewer the paneer and the vegetables. Heat a grill pan over the medium-high flame. Brush the pan nicely with mustard oil. 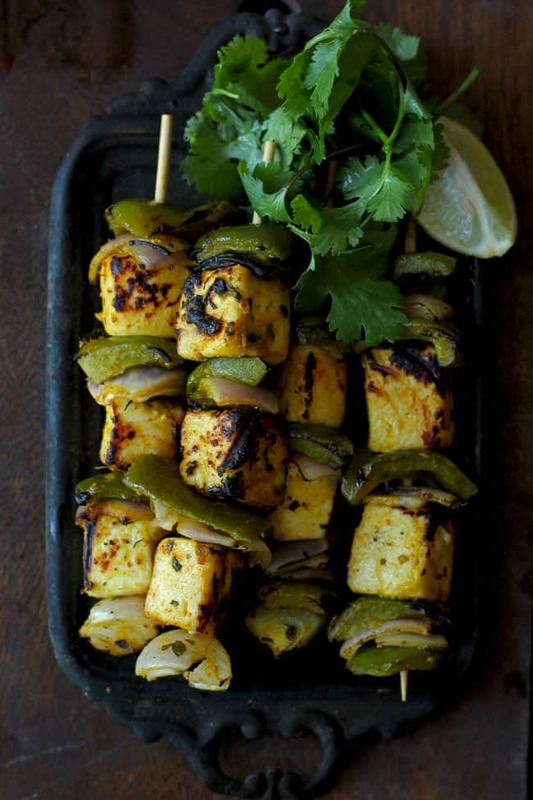 Once the pan is heated arrange the skewered paneer tikka. Cook the tikka evenly from both the sides. Nice charred marks would appear on the paneer and the vegetables once it is cooked and ready to serve. 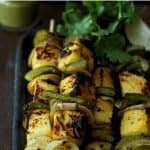 How To Make Paneer Tikka In A BBQ Grill? Marinate the paneer and the vegetables. Fire up the charcoal and prepare the barbecue grill. Brush the barbecue grill with little mustard oil. 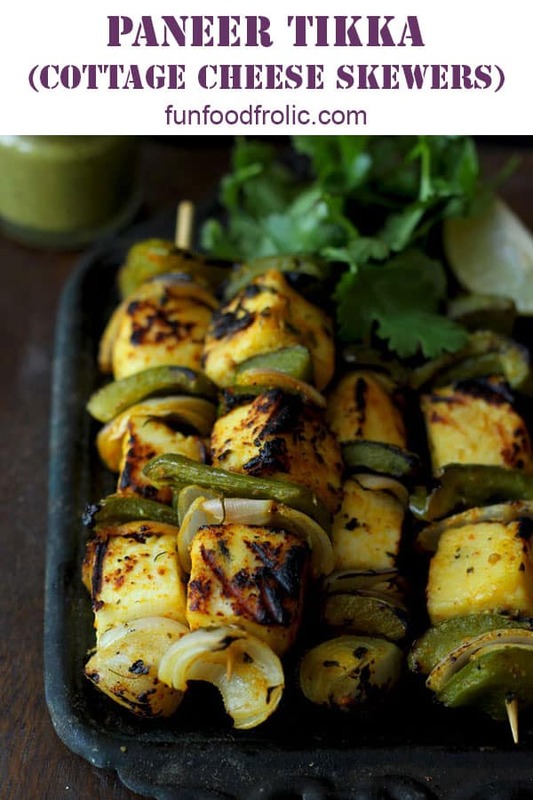 Place the paneer tikka skewers over the grill and cook evenly from both the sides. Once the paneer tikka starts turning charred and crisp from the edges remove it from the grill. Now you see how simple it is to make paneer tikka at home. And you have not one but three alternatives to cook them – oven, tawa, and BBQ grill. Simply marinade the tikka, pick the cooking method as per convenience and you have a deliciously good, gluten-free snack in no time. 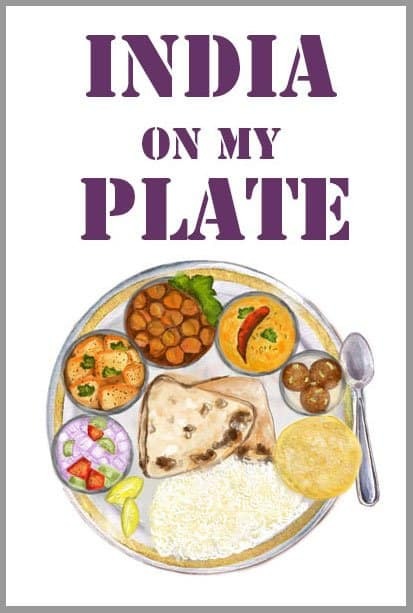 Did I tell you there are few must serve essentials with the paneer tikka? A refreshing mint and coriander chutney, lemon wedges and a sprinkling of chaat masala. Without these three essentials, the flavor of tikka is just so incomplete. This is the best Achari Paneer Tikka made at home in just 20 minutes. Learn how to make restaurant style paneer tikka on tawa in few simple steps. Cut the paneer and the vegetables. keep them aside in a bowl. Combine yogurt, ginger-garlic paste, spices, salt and whisk nicely to make a smooth paste. Gently crush the kasuri methi in between your palms and add to the marinade mix. Now add the mustard oil. Whisk the marinade nicely. Taste and adjust the seasoning. Add the paneer cubes and the vegetables in the marinade. Mix to coat the tikka with the marinade. You can marinade the tikka overnight or atleast for 2 - 3 hours. Now you can cook the tikka on a bbq grill, oven or over the gas stove on a grill pan. Either ways it does not take more than 15 - 20 minutes to get ready. Drizzle lemon juice on tikka before serving. 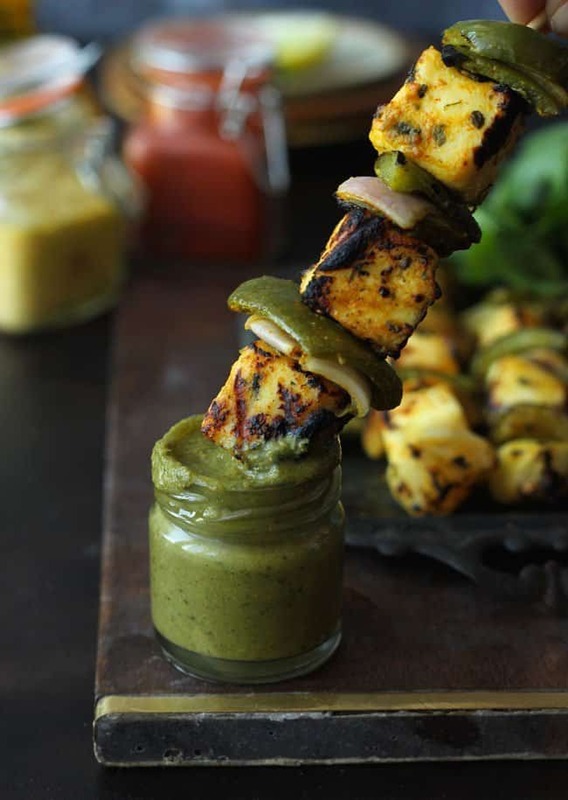 Serve Paneer Tikka with green chutney ( see recipe ). Gently crush the kasuri methi help release its flavor and aroma. 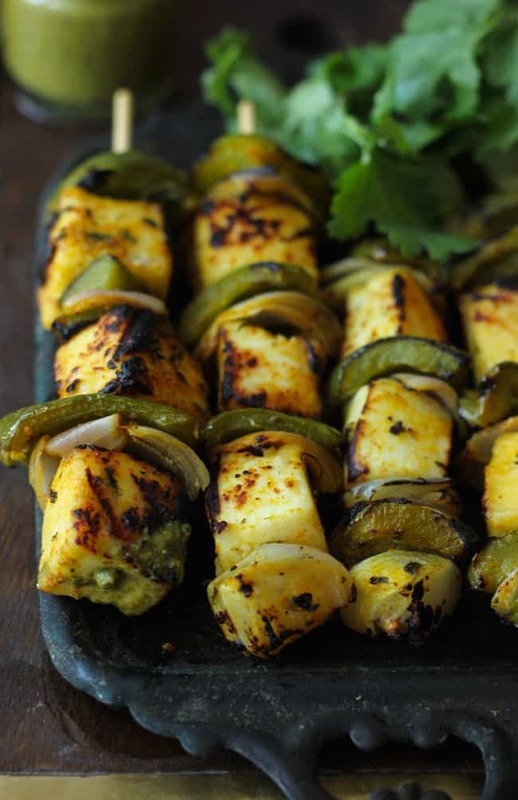 While cooking/grilling once the paneer and the vegetables turn little brown from the edges they are ready to serve. Leftover marinated paneer tikka can be used for sandwich/wrap stuffing or to make tawa pulao (see recipe here). Calories shared are for one skewer of paneer tikka.